The province of Malaga hides really wonderful places. Still do not know where to go on vacation this summer? If you want to visit the most beautiful villages of the Costa del Sol this summer and enjoy a vacation without leaving Malaga, these are the 5 most spectacular towns in Malaga that you can not miss. 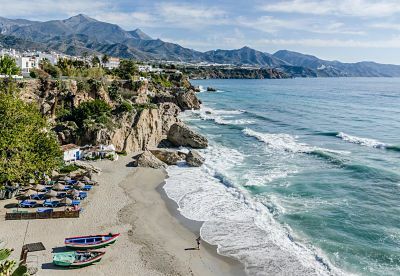 Nerja: has been the scene of films, advertisements and series. One of the most famous series and for which Nerja became known was ‘Verano Azul’, for that reason, the town offers a guided tour by one of the most mythical characters of the series, Tito, who will accompany you to visit its most characteristic scenarios, like the Chanquete boat that pays homage to Verano Azul. 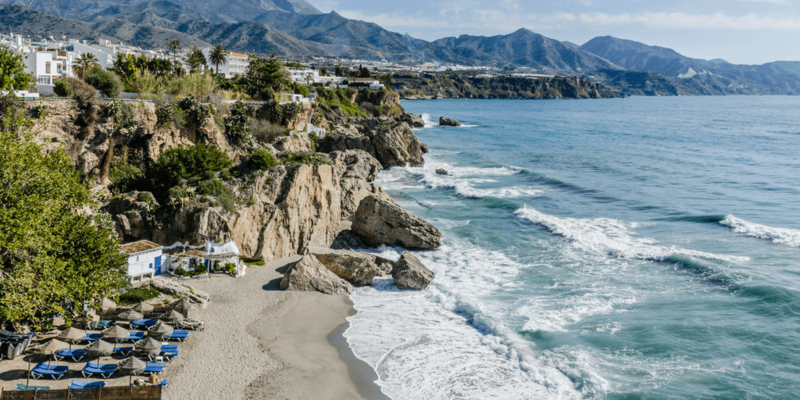 One of the obligatory stops in Nerja is the Balcon de Europa, a beautiful viewpoint located in the center of the town with views of the beach and the cliffs. Another essential visit is the Caves of Nerja, tourist caves of great archaeological importance, buy your tickets here. Finally, we can not forget the marvelous coves of Maro, the wildest virgin beaches of the Costa del Sol, with crystal clear waters and pure nature. The best known are ‘El Cañuelo’ and ‘La Cala del Barranco’. Frigiliana: is undoubtedly one of the most beautiful villages in Malaga, located in the Axarquía and characterized by whitewashed whitewashed houses and narrow cobbled streets full of flowers. It was awarded in 1982 with the first National Embellishment Award, considered an Artistic Historic Site since 2014 and in 2016 it received the award for the third Rural Wonder of Spain. Its old town, declared a historical and artistic complex, is made up of beautiful narrow streets that reach the most unique area of ​​Frigiliana, that of Barribarto, which we recommend visiting both day and night. The honey of cane is the typical product of Frigiliana and in addition, it is its star product, since it lodges the only existent factory in Europe. 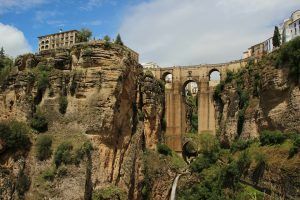 Ronda: is one of the best-known towns of Malaga, has the peculiarity that is seated on a ravine 120 meters deep and is surrounded by lush river valleys, Ronda is a paradise that is worth visiting. The most famous monument in Ronda is the Puente Nuevo, built in 1793 after more than forty years, linking the old and new areas, offering spectacular views of the Tajo de Ronda. To make a small route, we recommend going down the Tagus along the Camino de los Molinos to see the bridge from below and take some amazing photos of Ronda. Another thing that this town is known for is the birthplace of bullfighting, the Bullring of the Real Maestranza is one of the oldest and most beautiful in Spain. Arab remains such as the Baths, the Palace of the King Moro and La Mina, and the Arab Walls are some of the best preserved Nasrid works in Spain. 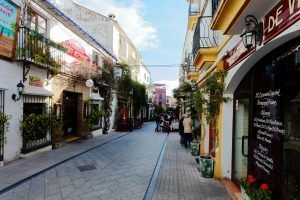 Mijas: is another of the towns of Malaga that stands out for its white houses with blue touches, flowers and labyrinthine streets. The most characteristic is its transport, the famous donkey-taxi, a fun and original way to visit Mijas. It is a town that has it all: mountain, beaches and golf courses. The most beautiful beaches are the well-known Calahonda and El Faro, are two coves of fine sand perfect for diving and windsurfing. 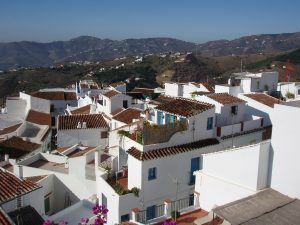 Mijas is undoubtedly one of the best places to visit in the summer on the Costa del Sol. One of the essential visits is the Mirador del Compás and the Virgen de la Peña Sanctuary, from where you can visit the most spectacular views of the Sierra de Mijas and its coast. Marbella: is one of the most important tourist centers of the Costa del Sol. One of its main tourist attractions is Puerto Banus, as it houses a large leisure area within the incredible facilities of its marina. The most beautiful part of Marbella is its historic center, set in a beautiful bay that shelters the most beautiful and characteristic corners of Andalusia, such as its whitewashed houses and the large number of orange trees for its streets and squares. If what you are looking for this summer is to enjoy beaches and chiringuitos, Marbella is one of the most complete tourist destinations that you can find on the Costa del Sol. In addition, you can rent a car in one of our offices located in Marbella and take the opportunity to visit the nearest towns such as Ronda or Mijas. Book your car with Marbesol for your summer holidays and get the best price.